I woke up in the morning (as one does) and with cuppa in hand went out to the deck to greet the day. Instead of the sound of surf I could hear the rumble of V8’s heading north to Rat Park which prompted me to throw down breakfast in a hurry and attempt to beat the crowds to check out the action and cars assembling before the gates opened to the general public. 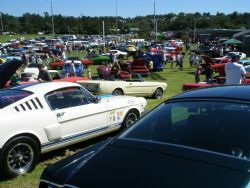 The 2008 American Car Sunday was held on the 24th February at Pittwater Rugby Park on Sydney’s northern beaches and attracted a big crowd of entrants and spectators alike. This year Autobahn of Warriewood was involved again and together with the organisers put together a great day out for enthusiasts and families. Blessed with glorious sunshine and a light sea breeze there was plenty to see and do with lots of classic cars resplendent in all their chromed glory. 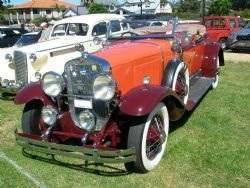 There was a large showing from all the major brands of American cars over the years. The Ford Mustangs covered most of the southern hill with 65 through 72 featuring heavily along with a couple of concourse Shelby’s. All body styles including fastback, coupe and convertibles were on show and there were some standout resto mods amongst them. Other Ford’s included Cougars, Customlines, Cobras and the classic 32 rods. Taking up some shady real estate by the western fence was a good selection of sixties Thunderbirds with the deck chaired owners enjoying the shade and atmosphere. Chevrolet was well represented with a good smattering of tri five Chevy’s, Camaro’s and a few Corvettes. 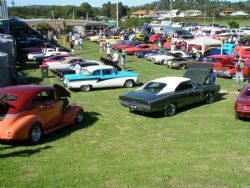 The tri fives were represented by two door coupe and four door body styles and the bulk of the Camaro’s were 67 through 69 cars, all in great condition. There was a newer C5 corvette, a stunning 72 big block roadster with maroon paint and new tan interior and a 64 modified roadster making quite a statement with flared guards, big rubber and bright blue paint work. Fins, fins and more fins were on display amongst the Cadillac crew and they had most models covered at the show. I didn’t think anyone had a garage large enough to accommodate one but I am obviously wrong as the mint collection on show clearly don’t spend their life outdoors. Not to be outdone Mopar’s were everywhere – Challengers, Chargers, Dart and Cuda’s could be found right across the grounds featuring small blocks right through to the 440 big block cars. There is something you have to love about a lime green Challenger, it definitely takes you back to the seventies and I am not sure any car manufacturer today would spray a current offering in this shade. On top of all this were Plymouths, lots of Studebakers, the odd veteran and vintage American classic, a good selection of hot rods and a standout Woody. Whoever owned this car had put a lot of blood, sweat and tears, not to mention money into it and it looked a million dollars. 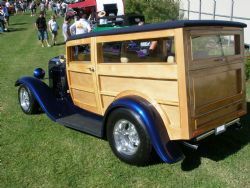 All the timber work had be redone and coupled with a leather custom interior and flawless dark blue paint job it really was a standout in a sea of great classic cars. Two things struck me about this show as being a little out of the norm. Firstly, I didn’t see one trailer meaning all of these cars were driven to the show. That is understandable given it was such a cracker of a day but it is encouraging to see everyone out enjoying their ride. Secondly, there were quite of few of the cars for sale. I don’t know if this was due to the end of summer approaching, a strong dollar encouraging owners to look for the next classic or project in the US, the petrol price trending upwards or the strong classic car market but proportionately there seemed to be a lot on offer. New this year there were People’s Choice prizes, the new venue and an entrance fee with the proceeds going to the Cancer Council for prostate cancer. Mark your diaries for the same time next year as I am sure it will be bigger and better so bring the kids along and have a great out.